On Saturday 25th May 2002, Newark Archaeological & Local History Society (NALHS), in conjunction with Millgate Conservation Society, attended the unveiling of a plaque to William Cubley on 80 Millgate, then the property of Councillor & Mrs Phil McCauley. Unveiled by the Mayor of that year, Councillor Peter Foster, this marked the 14th plaque the Society has promoted. William Harold Cubley was respected not only for his artistic achievements, but also for his involvement with local affairs. Earning his living as a portraitist and landscape artist, he walked to and from teaching posts in Grantham, Newark and Lincoln. He also found time to represent the community at local elections. 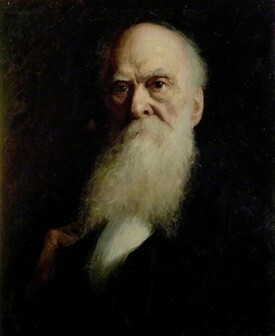 He was born on 9th October 1816 in Heanor, Derbyshire. 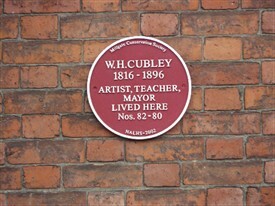 The son of a needlemaker, Cubley trained as a house painter when his family moved to Nottingham in 1819. In 1834 the family moved to Newark. In 1838 Cubley married Jane Spencer and William Caparne’s father witnessed the wedding. Having married, Cubley devoted his time to painting, travelling to London once a week to attend classes at Royal Hibernian Academician Richard Rotherwell’s studio. He also took classes from Sir William Beechey, a former pupil of Sir Joshua Reynolds who had been portrait painter to George III’s wife, Queen Charlotte. The work that Cubley produced owed much to the influences of both Rothwell and in particular, Beechey. He was a traditionalist in the mould of Reynolds and even his later works reflect this. Cubley had a great love of landscape at which he excelled both in watercolours and oils. 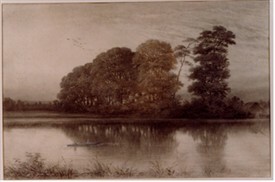 He depicted not only local views, of which Crow Trees at Farndon is one, but also the scenery of Wales, Scotland, the English Lakes and the Home Counties. Frequent trips to the Continent led to his painting Lugarno in 1883 and Naples in 1885. Cubley frequently exhibited at the Royal Academy and the Society of British Artists’ Gallery in Suffolk Street, London. In 1873 he won a gold medal for his landscape, Llyn Idwal at the International Exhibition in South Kensington, which was purchased by the Walker Art Gallery in Liverpool. Both Sir William Nicholson and William Caparne were among his many pupils. Cubley had a great fondness for Nicholson in particular, taking him on many of his painting trips, and was responsible for encouraging the young Nicholson to pursue an artistic career. Nicholson said of his portrait of his mentor “a very poor portrait of a very fine man ”. Cubley’s second wife, Amy Jane Brown whom he married in Wandsworth in 1886 after the 1873 death of his first wife, accompanied him on these trips. His artistic talents also extended to music, and he composed and wrote the music for two songs, The Midnight Wind and The Maiden’s Lament . In 1884 he published a book Perspective Drawing which expounded his artistic theories with the aid of 40 plates and illustrations. He also had a fondness for literature, poetry in particular, which he transposed to his landscapes. Cubley was greatly respected by his community and in 1864 represented Newark North Ward. He was a strong Gladstone Liberal and worked at various contested elections in the town and district. In 1840 he painted a portrait of William Gladstone who had won his first parliamentary seat at Newark. Many of Newark’s aldermen and mayors were also painted by Cubley, who was himself a member of the Town Council for some years before being elected Mayor in 1866 and subsequently becoming a Justice of the Peace. Failing health never got in the way of any of Cubley’s painting trips. With his agile frame, his close-cropped hair and long beard, he was a feature of local life. He was working till the end, when taken ill at Brynddu, Llanberis in North Wales during a summer painting trip. After what was suspected to be just a chill, he died and was later buried in Newark cemetery. Many of his fine paintings can be seen at the Newark Town Hall Museum Gallery, and at the resource Centre of Newark Museum Service NSDC. This page was added by Jill Campbell, Nalhs Newark on 01/08/2011. Thanks you! Well done. William Harold Cubley was my gg grandfather. William Harold Cubley was my Great, Great Great Grandfather. I have been pursuing my family history and wanted to trace my geneology as far back as I can. If anyone has any further information to the family, I would greatly appreciate it. Thank you Lewis and Brian, for your kind comments. Any comments you would like to make about William - why don't you create your own pages? Plus, any information on Henry Hadfield Cubley (William's nephew). Our Society used images of some of William's local artwork in one of a set of six 'Art banners' which we have, over the past 2 years, shown in places around the town (Newark). They have been greatly appreciated and commented upon. If you have any family photographs, why not upload them on the 'OurNotts' website? It is very easy to use!